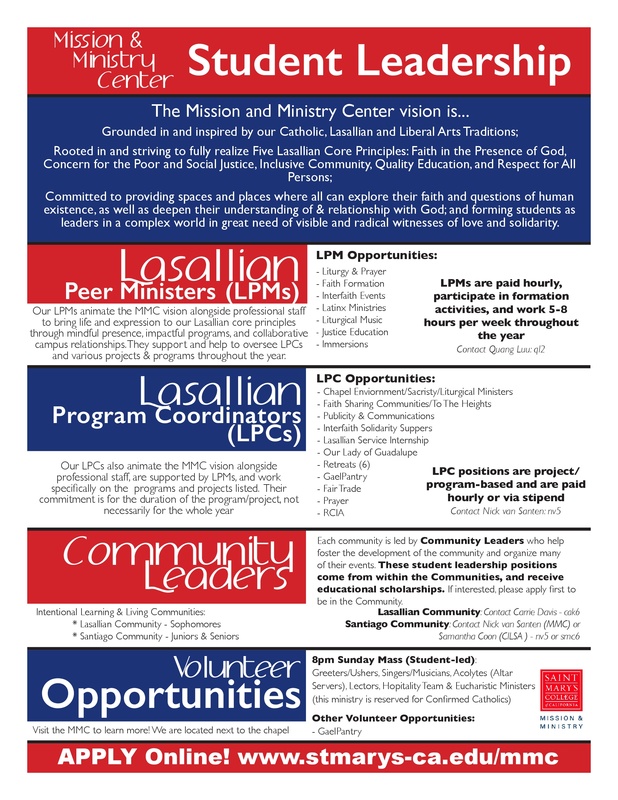 The Mission and Ministry Center vision focuses on providing spaces and places where all can explore their faith and questions of human existence, as well as deepen their understanding of & relationship with God; and forming students as leaders in a complex world in great need of visible and radical witnesses of love and solidarity. Click on tabs below for more infomation about the positions listed above. Liturgy & Prayer - the LPM for Liturgy & Prayer seeks to provide liturgical settings and ritualized celebrations that nourish the spiritual life of the College community. Rooted in the Eucharistic liturgy as the “source and summit” of our Christian life, this person helps to animate the rich tradition and diverse expressions of Catholic liturgical life, all the while fostering prayerful opportunities for those of different faiths to be spiritually integrated within their lived experience. Each community is led by Community Leaders who help foster the development of the community and organize many of their events. These student leadership positions come from within the communities, and receive educational scholarships. If interested, please apply first to be in the community, and click on the links below to read more about them. Visit the MMC to learn more! We are located next to the chapel.